In early 2015, I saved some time from my annual India visit to go to Thailand. The fact that J was living there and we had been in a semi serious long distance relationship was the primary motivator. Also, I loved Thai food and culture and was eager to see the place that I had heard so much about. What made the decision to go easier was the fact that Thailand is one of the very few countries where an Indian citizen can get a Visa on Arrival. The entire process was painless and took me 20 minutes at Bangkok airport. Most of my time was spent in Phuket where J was based. Very tourist oriented -a casual drive down the streets at night on a rented scooter would show scads of tourists, some passing through, some for the long haul, Phuket definitely was Thailand-light! The advantages of this were everywhere to be had, beaches were beautiful, scooters plentiful and almost everyone spoke basic English. The cost of living in Thailand is reasonable and unlike other places they do not seem to have a 2 tier pricing system in restaurants. It was in Phuket that I experienced my first proper Asian market and an unforgettable experience it was too. The thronging crowds were busy walking down aisles of colourful and aromatic food. There was plenty for the adventurous to try and J was the perfect host, giving me a taste of her favorites and pointing out things I shouldn’t miss. I was also excited for the trip from the perspective of trying out some new film. Cinestill had just launched their 800 speed Tungsten balanced Cinema 35mm film and I was eager to try it. J had suggested a visit to Ko Yao Noy (Ko meaning island in Thai)- the less popular island in a chain off islands off the coast of Thailand in Phang Nga bay. I bit the bullet and just took the Nikon FM2n loaded with Cinestill 800T. The film was still somewhat new and experimental so on roll 2 (of 2) I had some issues with emulsion but nothing I could not live with. 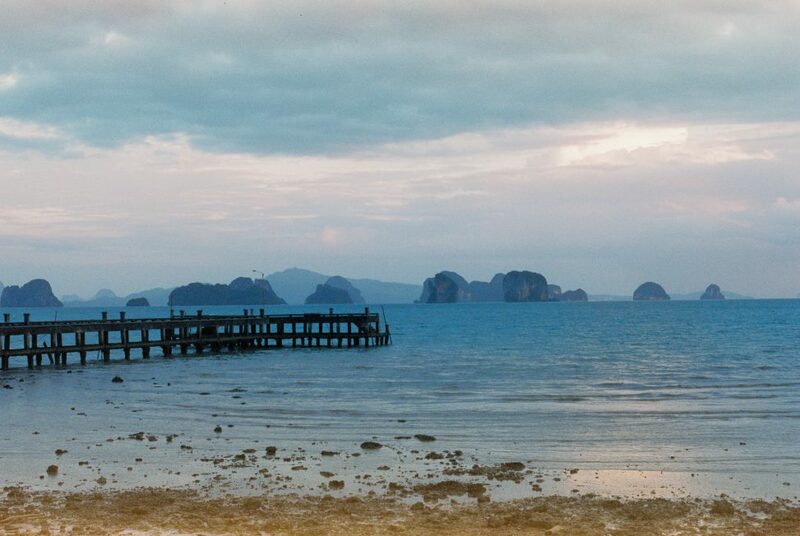 Ko Yao Noi was every bit of the island paradise we had imagined it to be. It was off season and the tourists were nowhere to be seen. We booked a scooter at the jetty and drove around to our hearts content, stopping at beaches, going to the scenic places and eating great food ( including some of the best damn curry- Massaman-that I have ever had in my life with the surf pounding the beach across a lovely moonlit beach). Finding accommodation without prior reservation was also a breeze(though not recommended in peak tourist season). All in all, you see plenty of people retiring to Thailand and spend a week in Phuket and you will see why. The life is laidback and Thai people are wonderful, their country beautiful, food delicious and within reach of the average traveler. If I found a position in Thailand, I would not hesitate for a second to move there on an expat package. However, being a salaried schmuck meant my time there was brief and I was on an airplane headed out saying goodbye to J sooner than I liked. The future held more of both for me but that is a topic for another post!